Situated on the south coast of Tenerife and very close to the Reina Sofia Airport, Golf del Sur, as its name suggests, is primarily a golfing holiday resort. There are several wonderful golf courses on offer, including a 27-hole championship course, and fairways dominate the lush landscape; however, non-golfer's will find plenty to occupy them, including the usual sun, sand and surf that attracts visitors to Tenerife. There is a beautiful coastal walk running the length of the resort's shoreline, with plenty of picturesque view points and benches along the way. San Blas, a charismatic little town very nearby, has a bustling commercial centre consisting of three squares ringed with restaurants, bars (including karaoke bars) and shops, and there is also tennis, adventure golf and bowling on offer. For those seeking more action, the resort is close to the ever-popular Playa de las Americas and Los Cristianos resorts, which are accessible by bus. 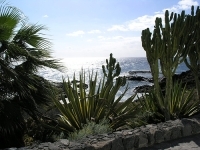 Hiring a car is also an excellent way to explore the surrounding areas and take in what Tenerife has to offer. Like everything else at the resort the shops are dominated by golfing needs, but San Blas has some interesting shops, and the large and popular neighbouring resorts also boast all the usual souvenir shops and holiday boutiques. Restaurants in Golf del Sur and San Blas include some traditional Canarian eateries and plenty of international fare for foreigners. While in Golf del Sur, holidaymakers should be sure to taste the culinary pleasures of The Lobster Pot. Golf del Sur is not a party resort but it is a lively one with some great bars and one nightclub, Taboo's, which plays a mixture of dance and house music and is frequented by a refreshing variety of people. The golfing clubhouses also do a booming trade, especially in the peak summer months. Apart from the golf courses, driving ranges and clubhouses, visitors can enjoy boat trips along the rugged coastline, scuba diving, and even submarine safaris. The big resorts nearby offer numerous water sports and there are a number of worthwhile excursions from Gold del Sur. Planes taking off and landing at the nearby Tenerife South Airport can be a bit noisy for visitors.